A co-worker had mentioned that a holiday was approaching and that we’d have a day off from work that equaled a long weekend. He had planned to go to Paris with the free time. Which got me to thinking maybe I should use the time to travel as well. I got the idea that maybe my mom could come for a visit and we could travel together. After asking around about European cities others had been to and recommended, I was informed of United Airlines European cruises. 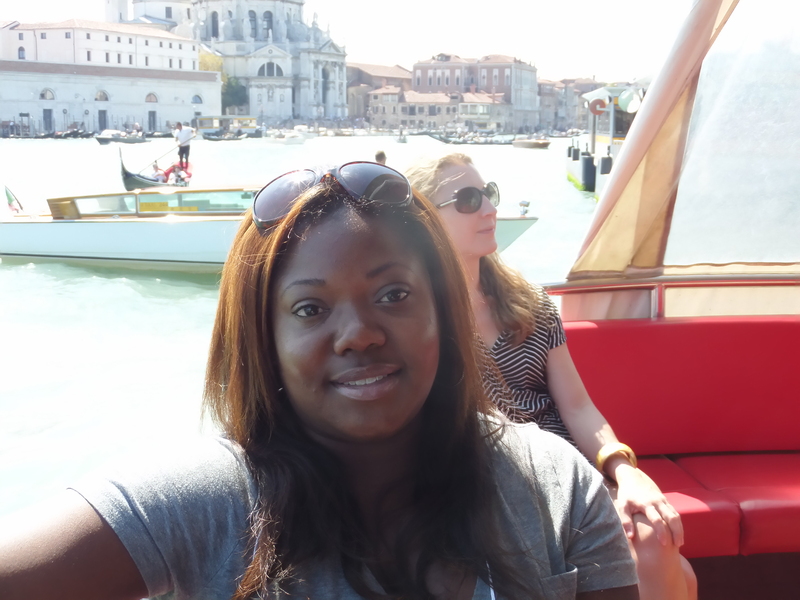 Initially I had wanted to go to Italy since I had never been, luckily I found a cruise leaving from Venice and that’s when I went into planning mode. My mother was immediately on board to go wherever I chose. I searched and put the trip together from beginning to end including getting my mom from the states to me in Germany on a budget. I found a roundtrip-direct flight from BWI (Baltimore) to FRA (Frankfurt) for my mom on Condor Air for $781.00 USD. I booked this exactly one month before our trip to Venice. My mom arrived on the 27th of August to Frankfurt. We left on the 29th of August to begin our vacation together. RyanAir is a popular cheap airline that services many locations throughout Europe, but their flights usually leave out of the less popular airports. Since I was ballin’ on a budget this seemed like a great idea. For Germany that airport is HAHN, less than a 2-hour drive outside Frankfurt. We took the Bohr Bus from the Main train station in downtown Frankfurt to HAHN for 14.00 euros ($18.76 USD) per person for a one-way trip. Our direct flight on RyanAir was from HAHN to Venice-TREVISO and I pre-paid for one checked bag for each of us and ground transportation from the airport in Venice to nearby our hotel. The total was $211.45 USD for both of us. Not bad at all. My mom picked our hotel, Casa Sant’andrea, was booked through Olotels for 29 through 31 August 2013 with a twin room and breakfast for $240.00 USD. Luckily the bus let us off about 3 blocks from our hotel that was right on the water. So it was very conveniently located. Our Royal Caribbean cruise booked through United Cruises came to a total of $1,659.85 for the both of us and the itinerary is below. Even better was how close our hotel was from the departing port, walking distance or the next stop on the “People Mover” the elevated train system in Venice. 1 Venice, Italy — 5:00 p.m.
2 Split, Croatia 7:00 a.m. 3:00 p.m.
4 Kusadasi (Ephesus), Turkey 8:00 a.m. 6:00 p.m.
5 Mykonos, Greece 7:00 a.m. 5:00 p.m.
6 Argostoli, Kefalonia, Greece 12:00 p.m. 8:00 p.m. I used a total of 25,000 United Airlines Award miles (plus $52.60 in taxes) for our return flight from Venice to FRA, Frankfurt’s main airport. Maybe $2182.65 seems like a lot of money but for two people at close to only $1000 per person for a 7-day cruise and roundtrip airfare and 1.5 days in Venice, I don’t think it’s too bad. This was my first time putting together a trip like this and with less than a month prior. I was proud of myself. I now know I could have gotten the cruise for a lot less but it was -really my first cruise, now I know better. Posted on November 11, 2013, in Family, Germany, Life Abroad, Life Changers, Living Out Loud, Travel and tagged Ballin' on a Budget, Discount Travel, European Cruise, EuroTour, Frankfurt, Germany, Italy, Mykonos, RyanAir, United Airlines, Venice. Bookmark the permalink. Leave a comment.